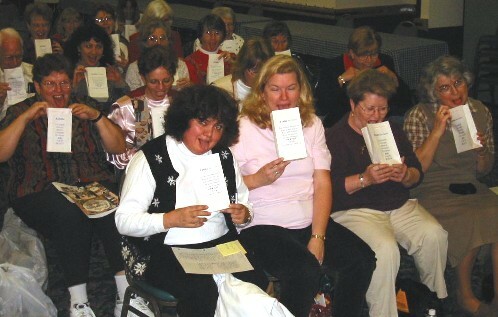 When quilting expert and barf bag afficionado, Ami (rhymes with salami) Simms, presents her lecture of quilts entered in the Worst Quilt In The World Contest ®, she passes out Delta ® Air Sickness Bags to her constituency and has them assume the position, just to get ready to see the quilts. Kudos to Ami for keeping the spirit of motion sickness alive! The Ozark Piecemakers from Springfield, MO are pictured here.